On the look-out for the best integrated oven you can buy? Perhaps yours has packed up recently or you're on the hunt for an updated model? Or maybe you're installing a streamlined kitchen and are looking for an integrated model for your new room? What's to love about integrated ovens? They're sleek-looking and will fit seamlessly into a contemporary kitchen scheme; they can be placed at a height to suit your layout, cooking habits and needs; and they come with a range of beneficial features and a variety of prices to suit all budgets. 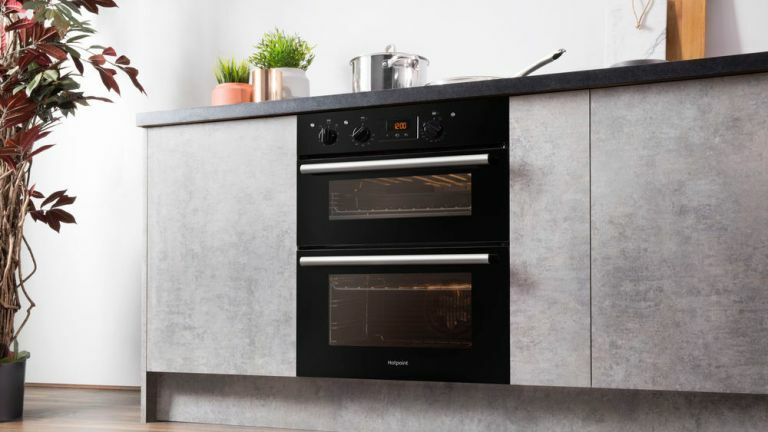 So, whether you're after an integrated smart oven, a double model, a basic integrated oven or an oven specifically for cooking pizza, we've got all the best buys right here. Looking for more kitchen appliance recommendations? We know the very best products you should buy. An average integrated oven is around 70ltrs, which is ideal for medium-sized families. Is a single oven enough for you? If not, and you don't have enough space for a double, consider our first choice, the SAMSUNG Dual Cook Flex NV75N5671RS Electric Oven which is the size of a single oven but has the capabilities of a double oven. Self-cleaning ovens will cut down on maintenance for you. A setting to ensure crisp pizzas? Fast preheat? Plate warming? Think about the features you'd really love from an oven and work from there. Although this sleek-looking integrated oven is a single, albeit with a generous 75 litre capacity, it has a clever flexible door, meaning you can cook a pizza on the top and a cake on the bottom at different temperatures, making it as flexible as a double oven. It has 11 cooking useful functions, from EcoGrill to FastPreheat and even ProRoasting. Thanks to the pyrolytic cleaning system, you'll never have to scrub your oven clean of grease and residue again. This integrated oven has an LED display, touch controls and retractible dials, meaning it's perfect for a streamlined look. In our opinion, this is the best integrated oven you can buy. This Hotpoint single oven is a great bargain buy for the modern kitchen. If you live alone or only have a small household, this integrated oven is ideal for you. It fits neatly under the kitchen counter but has a surprisingly high capacity of 71ltrs, allowing you enough flexibility to make smaller meals for yourself and the family. This is one of the best ovens for bakers as it has a dough proving setting, and it’s got a steam clean function which makes it incredibly low maintenance. Simple yet effective, this oven is an all-round winner for those who are looking for something basic. Ideal for those who are serious about a) cooking and b) making their life easier, this Samsung smart integrated oven will deliver even cooking results every time thanks to its 4D Hotair function, PLUS you can use the Home Connect app on your smartphone to control it, meaning you can warm up dinner from the sofa, pre-heat the oven from the office and double check you've turned it off when you're out. What's more? The app comes with heaps of recipe ideas to choose from, and once you've selected one, the oven will automatically pre-heat itself and cook your food to perfection, without you having to press a button. It has 13 different functions, including Hotair Eco, Hotair grilling, pizza, defrost, plate warming and keep warm. It's also self-cleaning, has a touch-screen control and is incredibly sleek looking. On the hunt for an integrated oven fit for cooking family meals? This LOGIK double oven has two cavities and seven different oven functions, from fan heating to full grill cooking and top element cooking. It has an interior light and a viewing window so you can check on food without having to open the door, and thanks to True Fan Cooking technology, every meal will be cooked evenly throughout. Its family sized tray saves you the hassle of cooking meals individually, and its enamel coating and removable glass window make an easy job of cleaning. This is, without a doubt, the best integrated oven for those who always end up hosting family dinners. This integrated oven, similar to the Hotpoint Class 2 in our number two spot, has a slightly smaller capacity than our other choices. That said, it does boast a pizza function, the dials are easy to use and the oven has an A+ energy rating. With a timer that not only alerts you when your food is ready but also turns off the oven once your food is cooked, this integrated oven also features catalytic liners which absorb and oxidise greasy splatters, making it very low maintenance. Not just good with pizza, there are other handy features, such as SuperGrill for crispy sausages and bacon, Soft Cook for garlic bread, cakes and biscuits and Fan Plus for delicate dishes such as pastry. This integrated oven boasts no frills, but if you want one for a small kitchen, then this is the buy for you. Perfect for standard kitchens and medium-sized households, it can fit comfortably under the counter and has two cavities in which you can cook at different temperatures. It has an energy rating of A, as well as an enamel coating for easy cleaning and a programmable timer. If you're after a basic oven with a decent capacity at a small size, then this the best integrated oven for you. This double oven from the Hotpoint and Jamie Oliver partnership is available in two different colours to suit your kitchen's colour scheme. It has a low energy rating, a generous 59 litre capacity and is highly functional, thanks to a main electric fan oven and a second cavity for cooking and grilling; there's also a shelf in the top oven and two at the bottom for those family-sized meals. Talking of which... the oven is lined with grease proof enamel, making it easy to keep clean. Lead a busy life? This oven has a useful electric programmable timer which will turn off the oven for you.